UK-based Bennetts Associates is the first architecture practice in the world to achieve approved Science Based Targets and commit to the UN’s Climate Neutral Now campaign. This commitment builds on the practice’s track record of sustainability within the built environment by taking a leadership position on climate change. Climate Neutral Now is an initiative launched by the UN Climate Change in 2015 to encourage and support all levels of society to take climate action to achieve a climate neutral world by mid-century, as enshrined in the Paris Agreement. The scheme requires companies to measure and offset carbon footprints across three elements of the business. Meanwhile, the Science Based Targets initiative champions science-based target-setting as a way of boosting companies’ competitive advantage in the transition to the low carbon economy. The partner organisations behind it are World Wildlife Fund (WWF), UN Global Compact, the world’s largest corporate sustainability initiative, CDP, the global disclosure system for companies, cities, states and regions to manage their environmental impacts (formerly the Carbon Disclosure Project), and the World Resources Institute (WRI). Bennetts Associates was among the first architects to pioneer sustainability in large projects and bring it to the mainstream. 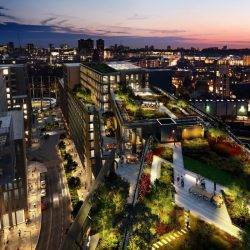 Recent projects such as 5 Pancras Square for the London Borough of Camden are recognised as exemplars for urban and highly economical sustainability. Continue to measure and improve conditions that relate to physical and mental wellbeing for staff across its three offices in London, Manchester and Edinburgh. They will also work towards being a single-use plastic-free office by 2022 and set policies that work towards incorporating the circular economy within their office practices as well as assist staff in switching their home energy to 100 per cent renewable sources. Science Says Your Beard Is Dirtier Than Dog Fur. Here’s How to Clean It Up.